Whenever you make a successful run, you may place 1credit from the bank on Bankroll. trash: Take all credits from Bankroll. "With the rise of crypto, banking has become much more complicated. Financial crime has not only kept pace, but exploded exponentially." This card is the one-time program version of Desperado run economy. Lets compare this card to Jackpot, a card with similar mechanics. At the start of each turn, you would place 1 credit on Jackpot, but can only retrieve them when you steal an agenda, (which may not even occur late in the game). 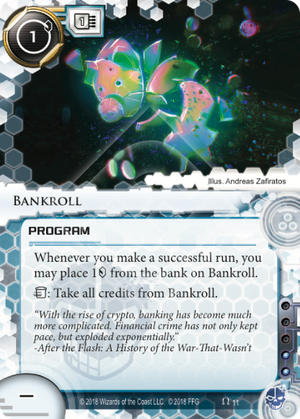 Bankroll places a credit per successful run, and if we consider that as once per turn for an aggressive criminal, is similar to Jackpot in that regard. However, it also costs 1 credit install compared to Jackpot's 0. Its credits can be pulled at any time, compared to Jackpot's only when an agenda is stolen, but occupies a memory unit in the meantime. However, Jackpot can be trashed if tagged. In conclusion, its power level is about equal to Jackpot's, and should be considered in aggressive criminal decks with spare MUs.